Here are some indian fish recipes. Starting off with a lovely fish curry recipe - which you can adapt for any fish of your choice. 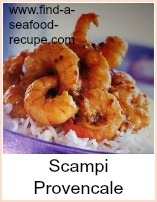 Then a shrimp byriani - which is a complete rice dish, either baked or cooked on the stove top with a vegetable curry. 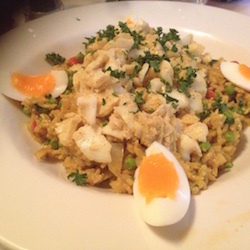 Finishing off with a kedgeree - a rice and smoked haddock dish which traditionally has been served for breakfast, but makes a great lunch or supper. In a pan, heat half the oil and add two thirds of the onion. Fry until soft and then liquidize them - either with a processor or pass through a sieve. Take the rest of the oil and heat it in a large pan. Add the onions and garlic and fry until soft. Add the spices and cook for a couple of minutes. Add the onion puree, mint, vinegar and yoghurt and cook a further 5 minutes. Add the fish and simmer for 5 minutes or so until the fish is cooked. Serve immediately with boiled rice, naan breads etc. Take a heavy based dual purpose (stove top and ovenproof) casserole dish. Heat the oil, add the onions and garlic and fry until soft. Add the rice and stir to coat in oil. Add the tandoori spice mix (curry paste, indian stock cube of your preference)and water and bring to the boil. Cover with a lid and place in the oven for 45 minutes. Remove and add the frozen peas and prawns. Stir to mix thoroughly. Return to the oven for a further 15 minutes or so, until the rice is tender. Whilst your seafood byriani is cooking, you can make the vegetable curry sauce. Boil the vegetables until just tender. Start with the potatoes and carrots and after about 5 minutes, add the beans, 2 minutes later the cauli and broccoli. A total of 10 minutes should be enough. Heat the oil in a pan, add the onion and fry until tender. Add the curry powder and tomato puree and stir to combine. Cook for a few minutes and then slowly add the stock and yoghurt. Simmer until thickened. Add the cooked vegetables and reheat before serving over the seafood byriani. Boil the rice in plenty of water until just tender. Add the peas for the last five minutes. Rinse and place in a warm serving dish. Whilst your rice is boiling, poach your smoked fish in milk. Remove the skin and bones and flake. Stir this and the butter into the rice. Put a spoon of curry powder into a little hot milk and stir into the rice - the aim is to make it slightly wet. Chop 2 of the hard boiled eggs and fold gently into the rice mixture. Slice the remaining egg and use to garnish the kedgeree. You need to adjust the curry powder to your taste - I use about a tablespoon, but I like the taste of curry. If your family are not so keen on spicy, then use some cayenne pepper instead. It is possible to substitute other fish in these indian fish recipes - use whatever you think looks best on the day you buy.